The RN102 is the two-bay cousin to the four-bay RN104 reviewed in May. The differences, which are highlighted in the comparison table taken from both products' web pages, boil down to two fewer drives, no LCD display and one less Gigabit Ethernet port on the RN102. The RN102's has the 104's sturdy metal chassis, but its front cover is plastic and there is no carry handle on the back. The callout diagram above shows the same eSATA, USB 2.0 and USB 3.0 ports, but only one Gigabit Ethernet LAN port. It was a tad easier to extract the 102's board from its case than the 104's. You still need to remove the side covers and rear panel, which contains the single fan that plugs into the main board. The 1.2 GHz Marvell Armada 370 is under the heatsink in the photo below and you can see the flash, RAM and other devices. NETGEAR supplied an RN10200 diskless model for review, so two Western Digital Red 3TB drives (WD30EFRX) were added for testing. Power consumption measured 16 W with the two drives spun up. I couldn't measure power consumption with the drives spun down because idle drive spindown still isn't supported in the 6.0.8 firmware used for review. Fan and drive noise were classified as very-low; I really had to strain to hear it in my quiet home office, even when under load during testing. 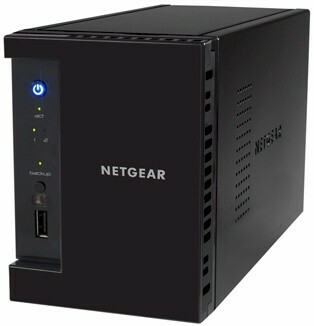 The RN102 runs NETGEAR's new OS 6, which was already reviewed in detail. The 102 has all the features of the 104, but doesn't support RAID modes higher than 1. We tested with 6.0.8 firmware using our standard NAS test process using RAID 0 and 1 volumes. Time to completely build and resync a 2 x 3 TB RAID 1 volume was just under 10 hours. Time until the volume was ready for use, although at reduced performance during the rebuild, was under a minute. The Benchmark Summary below shows that reads are faster than writes for both the Windows File Copy and NASPT File Copy methods that measure large file copy performance. The difference is almost 2-to-1 for the Windows File Copy method, which acutally uses a folder of 38 files. The NASPT File Copy method, which uses a single 1.3 GB file, showed only about an 8 MB/s read advantage. Turning to the NAS Ranker for the rest of the analysis, the RN102 ranked #6 among SoC-1 (single-core application-specific) class processors, which is the class for Marvell SoC's. If we look at the ranking for just two-bay products, the RN102 ranks fourth. Digging into the detail provided by the Ranker Performance Summary below, we see the RN102 is strongest in the Video and iSCSI benchmarks. Its weakest performances were in RAID 0 NASPT Directory Copy write (2.9 MB/s) and read (9.5 MB/s). For backup, the USB 2.0 / NTFS combination wasn't particularly impressive at just shy of 9 MB/s. But it did pretty well with rsync network backup with 27 MB/s for a #3 rank in this class. Although the RN102 ranks #6 among all 23 SoC-1 class NASes currently in the charts, that ranking changes to #4 out of 11 when you consider only two-bay models. Its pricing, at around $180 as I write this, is the same as the #1 ranked SoC-1 ZyXEL NSA325 and older #7 ranked QNAP TS-212. So you're not going to over pay for all the features that ReadyNAS OS 6 brings to the table. With its balance of features, performance and price, the ReadyNAS 102 should make its way onto the short list of many two-bay NAS shoppers.